Flt Lt S Muhilan was born on 08 March 1972 at Belgaum in Karnataka. He completed his Bachelor’s degree in Science in July 1992 from Bangalore and later joined the Air Force as a cadet after clearing the Combined Defence Services Examination. He was commissioned into IAF on 18 December 1993 as a pilot and underwent training as a helicopter pilot. After serving for a couple of years in various helicopter units Flt Lt S Muhilan got posted to 152 Helicopter Unit on 02 March 1998 which was operating Mi-17 helicopters. 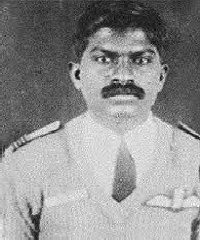 Flt Lt S Muhilan was a very passionate flier and a highly dedicated officer. He had over 1250 hrs of flying to his credit and was considered to be one of the best shot in rocketry. He was a professionally competent helicopter pilot and had experience in flying both the Mi-8 and Mi-17 helicopters. His flying skills would enable accurate delivery of lethal weapons against well entrenched positions. Intimately familiar with high altitude operations, his experience was an asset to the IAF during its operations. During 1999, Flt Lt S Muhilan was serving with No 152 squadron Helicopter Unit, since 02 Mar 1998. By May 1999, a large scale planned infiltration by militants backed by the Pakistan army, had been detected in Uri, Batallik and Drass sectors and Indian Armed Forces were ordered to clear the areas of the intruders. Along with the operations by the Army, IAF also undertook air operations to meet the objective. One such operation was undertaken by 152 Squadron in Drass sector. On May 28, Flt Lt S Muhilan was flying as a captain of a Mi-17 helicopter during an attack mission against ground positions strongly held by Pakistani infiltrators in the Drass sector. The enemy forces were well entrenched and were equipped with anti-aircraft guns and surface to air missiles to take on possible air attacks. Flt Lt S Muhilan with his Mi-17 helicopter repeatedly carried out attacks in the face of fierce enemy opposition in the form of ground fire and missiles. Unfortunately in one of retaliatory actions by the enemy forces his helicopter got hit by the US made Stinger SAM(surface to air missile). Since the helicopter took a direct hit the damage caused was massive and the aircrew had no time to take any emergency manoevres. The helicopter crashed and the valiant air crew comprising Sqn Ldr Rajiv Pundir, Flt Lt S Muhilan,Sgt Raj Kishor Sahu and Sgt PVNR Prasad were martyred. Flt Lt S Muhilan was a valiant air warrior and a committed soldier who laid down his life in the service of the nation. Flt Lt S Muhilan is survived by his wife Mrs Bina Muhilan and son, Dhruv. Still the heart that burns for the nation.. we all love you.. Rest in peace my ever cheerful room mate..